Ready for a juicy, hearty, flavor-packed veggie burger that’s super pretty to boot? 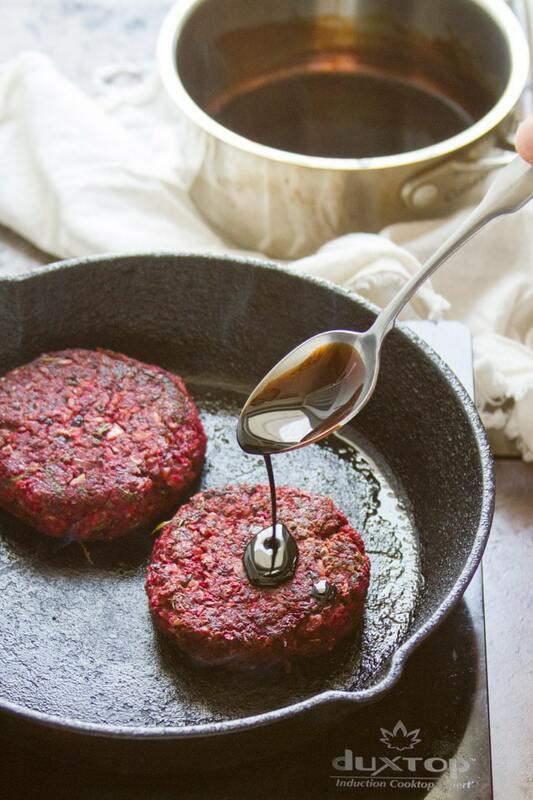 These vegan beet burgers bursting with color and flavor, and topped with a balsamic glaze that adds zip and a touch of sweetness. I find most veggie burgers to be lacking in the veggie department. Most of them are just made of beans! How can you call that a veggie burger? Well, the thing is, you kind of need beans to hold the burger together. As I discovered a few years ago when making my first attempt at cooking up a beet burger. They totally fell apart and I was so sad. So yeah, you need beans to make a veggie burger. But that’s no reason not to put some veggies in there too, right? Actually, bean/veggie mixes are my favorite types of veggie burgers. I do this all the time: white beans + kale, white beans + artichoke hearts, and black-eyed peas + a bunch of other stuff. Oh, and now beets + black beans. Which is an awesome combination because it makes not only for a super hearty, super delicious burger, but also one that’s really pretty, don’t you think? Balsamic vinegar and dill are two of my favorites ingredients for seasoning up beets on their own, so I decided to use them to season my burgers too. The zippy flavors go so nicely with the sweetness of the beets. You’ll start by making a balsamic reduction. Simmer some balsamic vinegar and brown sugar until it gets thick and syrupy. While that simmers away you can prep everything else. All of the burger ingredients go into the food processor, along with a little bit of your balsamic reduction. Pulse it away until everything is finely chopped (but don’t let it turn to mush). Shape the patties and grill them for a few minutes on each side. For the finishing touch, you’ll drizzle the burgers with a bit of the balsamic reduction and cook them for another minute or so on each side. I topped my burgers with some cashew cream cheese with some garlic and dill added in, but you can use your favorite vegan cheese or mayo if you prefer. You’ll probably have some of the balsamic reduction left over, so pour that on the patties or drizzle it on your greens if you like. To make this recipe gluten-free, use gluten-free oats and buns. Panko breadcrumbs can be substituted for the oats if you like. The patties are freezer friendly. I recommend just cooking up as many as you need and then freezing the rest of the burger mix. When you’re ready, thaw, shape and grill. They’ll taste just like they’re freshly made. Use a good quality balsamic vinegar. It makes a huge difference! 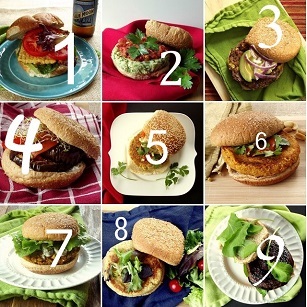 Ready for a juicy, hearty, flavor-packed veggie burger that's super pretty to boot? 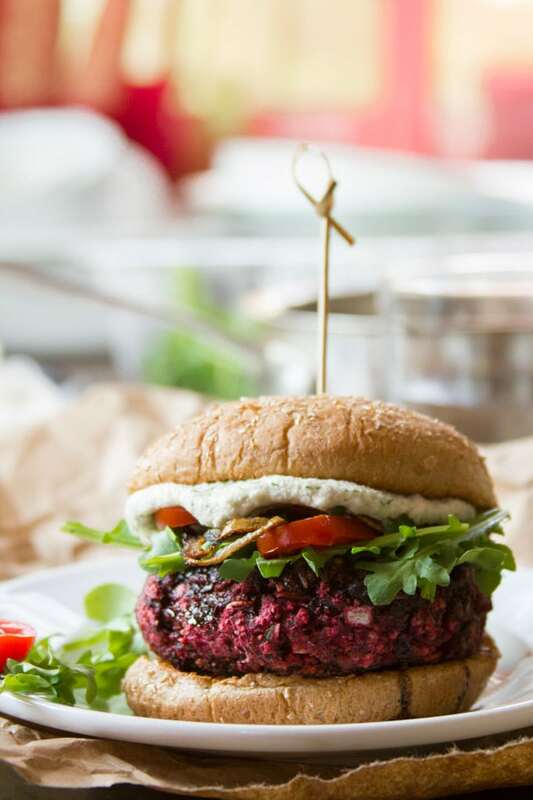 These vegan beet burgers bursting with color and flavor, and topped with a balsamic glaze that adds zip and a touch of sweetness. Begin by making the balsamic reduction. Stir the balsamic vinegar and brown sugar together in a small saucepan and place over medium-low heat. Bring the mixture to a simmer, lower heat and allow to cook, stirring occasionally, until the mixture is about as thick as chocolate syrup, about 15 minutes. Remove the balsamic reduction from the heat and allow it to cool for a few minutes while you prep the remaining ingredients. Place the oats into a food processor bowl and blend to a coarse powder. Add the beans, beets, onion, garlic, dill, salt, pepper, and 2 tablespoons of the balsamic reduction to the food processor. Pulse until the ingredients are finely chopped and well combined. Taste test the mixture and adjust any seasonings to your liking. Lightly oil a medium skillet and place it over medium heat. Shape the beet mixture into 6 patties and arrange as many as you can in the skillet without overcrowding. Cook the patties for about 4 minutes on each side, until lightly browned. Drizzle 1-2 teaspoons of the balsamic reduction over each patty. Flip and drizzle the opposite sides. Flip again and cook for a few seconds before removing the patties from the skillet. Cook any remaining patties in the same manner, adding oil to the skillet as needed between batches. Stuff the patties into buns and top with toppings of choice. Drizzle with some of the excess balsamic reduction if you like. Hi! I just wanted to say THANK YOU for your amazing recipes! They are so easy to follow and everyone of them that I’ve made have tasted so good. Every sunday when I’m planning for the next weeks meals, I always end up scrolling through your blog to find inspiration and new recipes to try! You’re so welcome!! Thanks so much Elsa! I’m so glad you’re enjoying them! I made beet burger with lentils before. I should definitely try this one with black beans. The balsamic vinegar sounds an awesome choice for the beet burger. I like the sweet beet with some tart flavors. Thanks for sharing! I haven’t tried, but I know I’ve seen recipes out there that use maple syrup to make balsamic reduction, so I think it should work! Do you use fresh beets or pickled beets? Does it matter? Fresh beets! Pickled beets have a much higher liquid content, so I’d be afraid the burgers would get mushy. 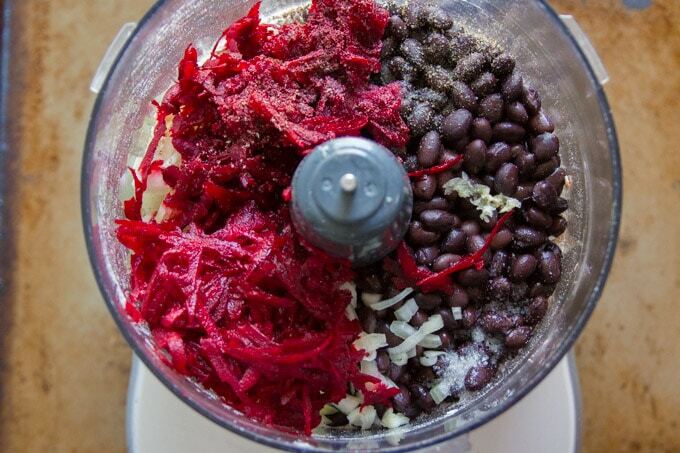 Do you cook the beet before adding to the food processor? This looks and sounds amazing but 8 minutes does not sound like the beet will be cooked. I love your recipes and have made several as we are vegetarian leaning to vegan. Thank you for your reply. Oh you are easily one of my favorite recipe bloggers, every time I’m in a rut I come here. I made these for dinner and they were the BEST veggie burgers I’ve ever tried. Normally burgers fall apart on me or are dry or the taste is just off, not with these! This is my go to recipe from now on! I did fold in a few Tbsp of hemp hearts after processing to add some extra protein and texture and tossed them on the grill after a quick sauté to get some grilled flavor but everything else completely left as is. So good! Awesome!! I’m so glad you enjoyed them!! And I love the idea of adding some hemp hearts for protein! Thanks Chelsea! These are so good! Even my very selective two year old asked for seconds. Yay!! I’m so happy to hear that! Thanks Julia! Making these for the second time today, they’re really delicious. You’ve now made it to my favourites list, I go to your site so many times!!!!! That’s so awesome to hear!! Thanks so much Kay! Sorry, but these were terrible. They actually tasted like dirt. Literally, like dirt. Worst thing I’ve made in a long, long time. 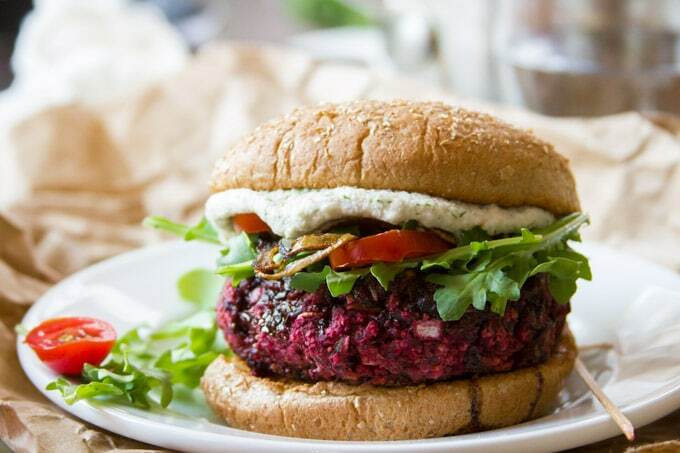 These beet burgers beat burgers! These look delicious! Is there a substitute for the oats? My little one is allergic:-(, do you think quinoa flakes might work? Thanks in advance! I’ve never made burgers with quinoa flakes, but I think it would work. Panko breadcrumbs always work for me, so you could try those too! Ahhh! I’ll try breadcrumbs! Thanks! I’m looking forward to making these later today. I’m not a fan of dill, can I take it out or substitute it? Absolutely! You can leave it out, or if you want to try a different flavor variation you could substitute an equal amount of fresh basil or 1-2 tablespoons of fresh thyme. Enjoy! I made these and actually stacked them on top of a bison patty with sweet potato shoe strings, glazed a pretzel bun with seracha mayo and Wisconsin aged cheddar and romaine. It was delicious. The next day we had the rest of the patties with an over easy egg stacked on top with Tabasco and avocado and a sweet potato hash. Great recipe, thy help together better than several restaurant ones did. Yay! I’m so glad you enjoyed them! Thanks so much! !